Fall views from the slickrock bench alongside the Big Creek Trail. DuPont State Forest is universally recognized as one of the best mountain biking destinations in the southeast. 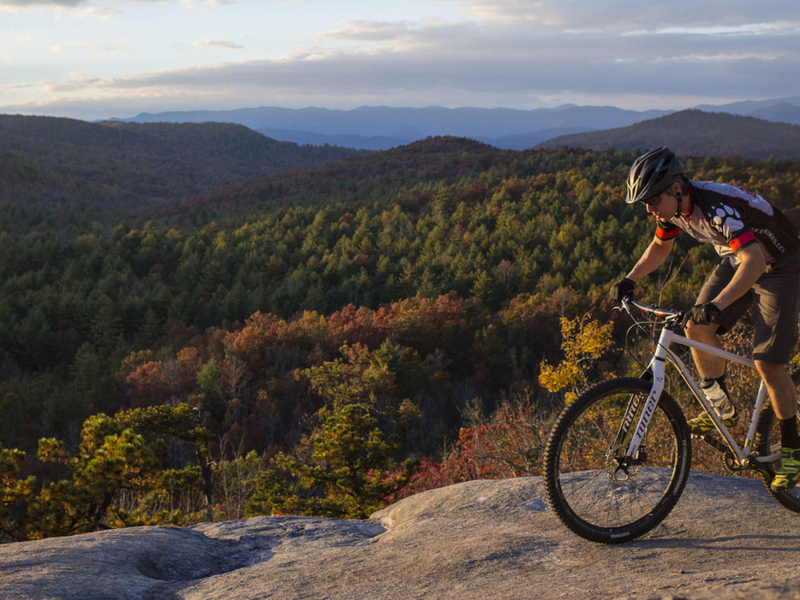 With nearly 100 miles of trails and a rare taste of eastern slickrock riding, spread over 10,000 acres of forest, it's no wonder so many mountain bikers make North Carolina their home. 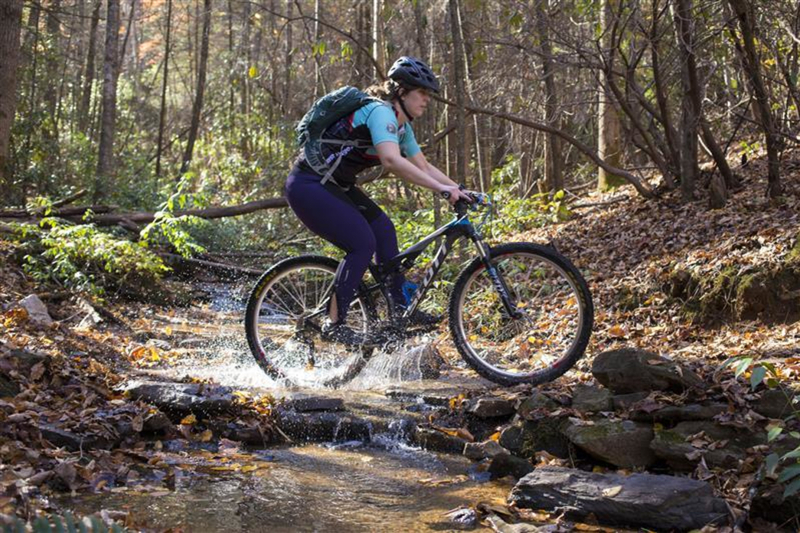 Just 20 minutes from downtown Brevard, this is a great place to hone your MTB skills before venturing into the more technically-challenging and remote trails of the nearby Pisgah. DuPont, Bent Creek Experimental Forest and Tsali are probably the three most widely-known mountain bike trail systems in this part of the world – though we’d argue that the BEST mountain biking is on the many trails of the Pisgah national forest near Brevard – but DuPont is easily our favorite, and the most diverse of the aforementioned locations. Located between Hendersonville and Brevard, just north of Cedar Mountain, DuPont State Recreational Forest’s name comes from the fact that the DuPont company sold the original tract of land to the state. Expect lush hardwood forest and clear, flowing creeks; after all, the popular 2012 movie The Hunger Games was filmed here. DuPont State Forest contains nearly 100 named trails, most of which are between a half-mile and one mile in length. Predictably, this results in an infinite number of potential loops, many of which are relatively short, as well as dozens of intersections on any given ride. 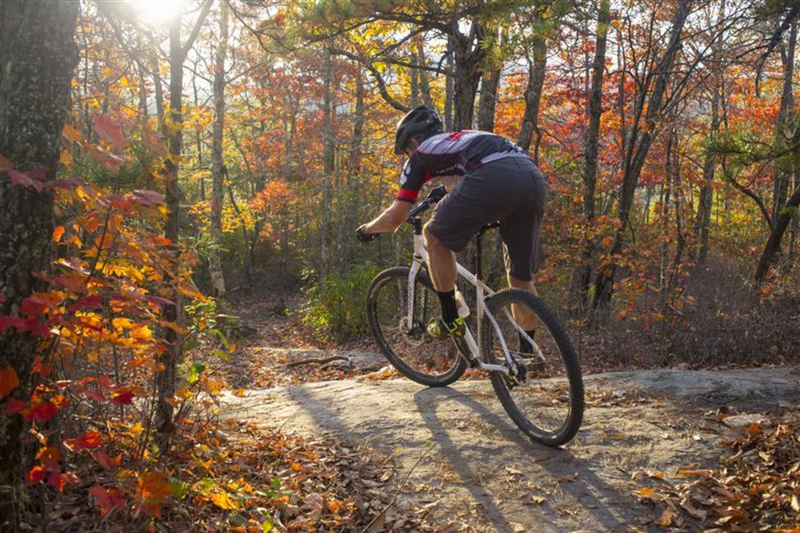 Rather than give you specific routes with two pages of turn-by-turn directions, here are two short, must-do MTB loops in DuPont that you can ride on their own or incorporate into a larger ride. 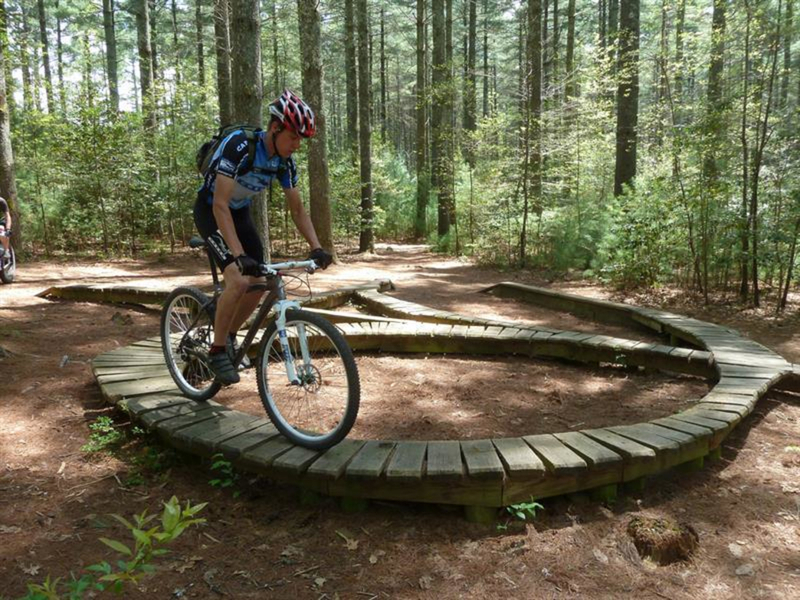 Ridgeline Loop (7 miles): The Ridgeline trail is, by popular opinion, the best downhill at DuPont. 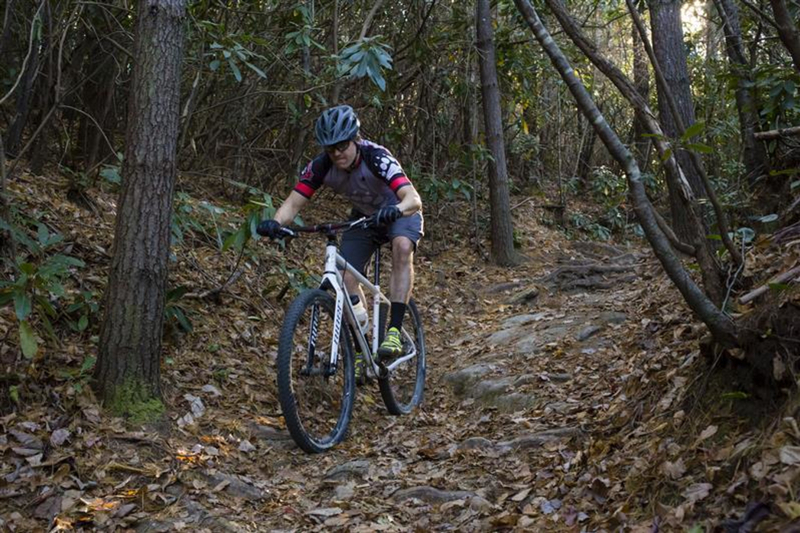 We’re inclined to agree; I definitely never get tired of this trail, with its massive berms, fun alternate lines and some of the best high-speed flow in North Carolina. From the Lake Imaging Access Area, follow Lake Imaging Road until you see Hilltop Loop on your right, then ride the excellent Hilltop loop. From here, we like to take a left on Lake Imaging, then climb back up and take a right onto Locust Trail, a left on Isaac Heath, a right on Jim Branch and finally a left on Buck Forest Rd. You can follow Buck Forest all the way from the end of Hilltop, but the singletrack route described here is more fun. Follow Buck Forest until you reach Hickory Mountain Road at the Guion Farm (Sky Valley Rd) parking area. Take a left and follow Hickory Mountain to the end. This is the top of Ridgeline; you can ride the Hickory Mountain Loop while you’re here if you want, then head all the way down Ridgeline and roll back to the car. 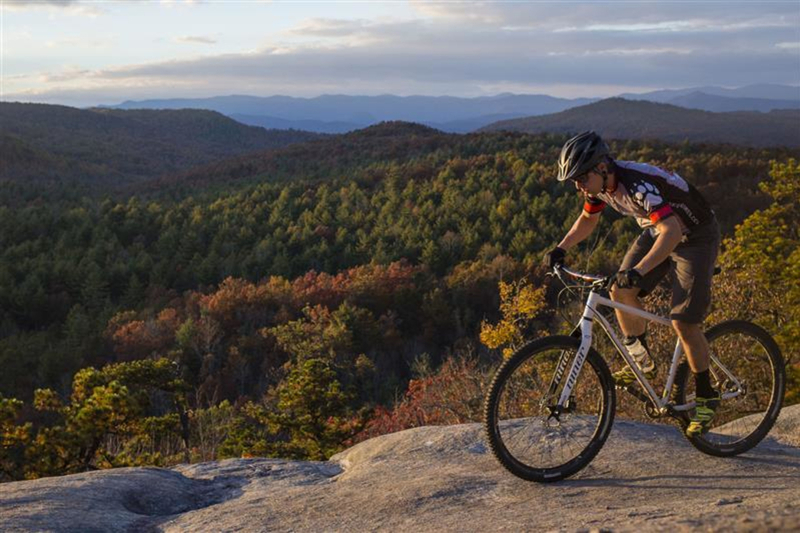 Slickrock Loop (6 miles): By slickrock we mean, of course, the famous Cedar Rock Trail, which includes some wonderful slickrock riding on exposed granite and incredible views of the surrounding mountains. There are multiple ways to access the top of Cedar Rock, but we like this route because it includes the excellent Big Rock downhill. Warning: this route is exposed and hot in the summer months! From the Corn Mill Shoals Access Area, leave the parking area and turn right onto Corn Mill Shoals Trail and follow it until you reach the junction with Burnt Mountain. We highly recommend the excellent Burnt Mountain loop, which you’ll want to ride clockwise; be warned, however, as the series of rocky ledges and water-bar staircases at the end of the Burnt Mountain downhill might be the most technical trail feature in the forest! When you arrive back at the Burnt Mountain junction, take a right, and this time stay left to follow Little River Trail. Little River forms a loop with Cedar Rock, and you’ll want to take your second left onto Cedar Rock to climb the trail counter-clockwise. 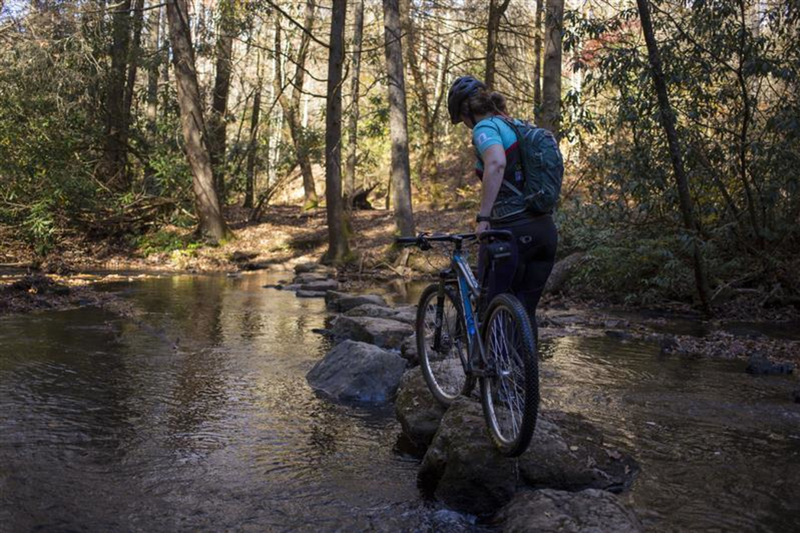 Enjoy your first taste of mountain slickrock; you’ll be surprised at how grippy the stuff is, and be sure to keep your tires off of the many patches of trailside vegetation. At the top, stop to take some photos of the incredible view, then hop on Big Rock Trail and blast back down to Corn Mill Shoals; watch out for a couple of semi-technical rock features at the bottom of Big Rock. DuPont mountain biking has a little bit of everything: narrow and flowy singletrack, gravel forest roads, bite-sized samplings of roots and rocks, a crossing of Corn Mill Shoals so slippery that most riders walk across it in their socks, an incredible exposed slickrock mountaintop trail on Cedar Rock, several picturesque waterfalls and enough trail to get lost in for days. If you're looking to bring young children, check out the "Kid's Loop" and kid-sized bike park with skinnies and other small obstacles near the Guion Farm trailhead on Sky Valley Road. 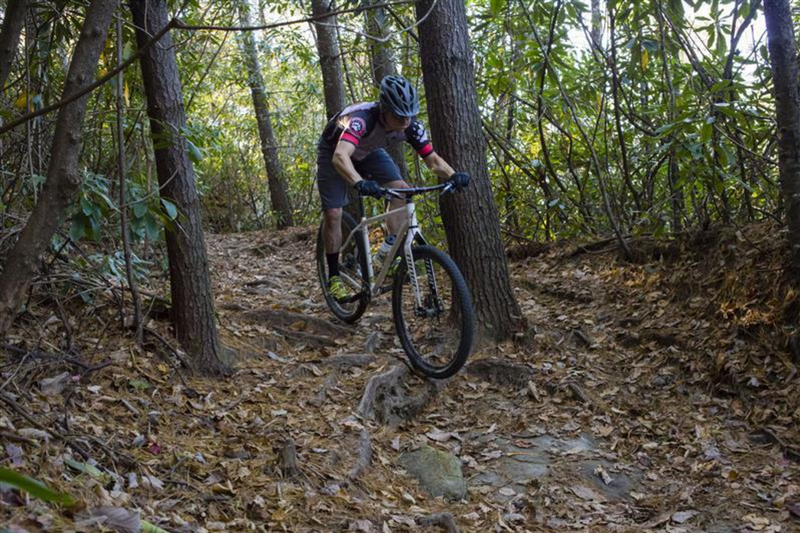 Despite being an hour or so from downtown Asheville, we've also included DuPont in our Asheville mountain biking guide due to its overwhelming popularity. 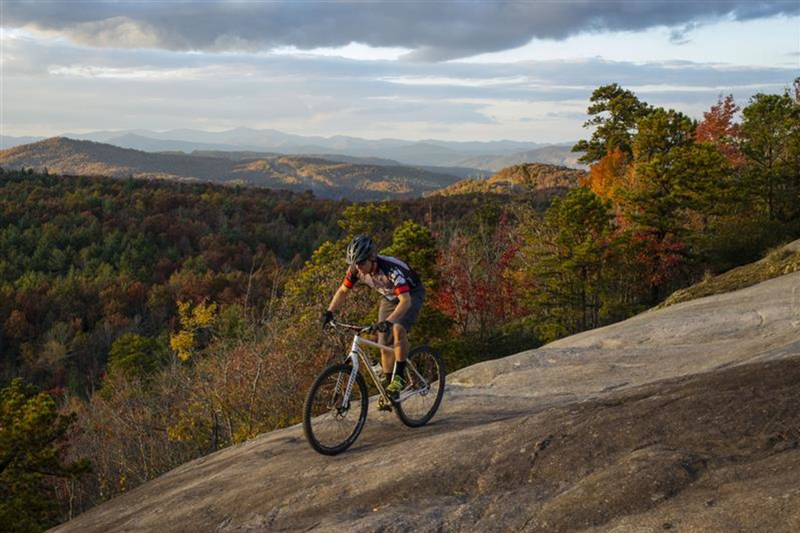 For mountain bikers who live in the Asheville area, it's well worth the drive! 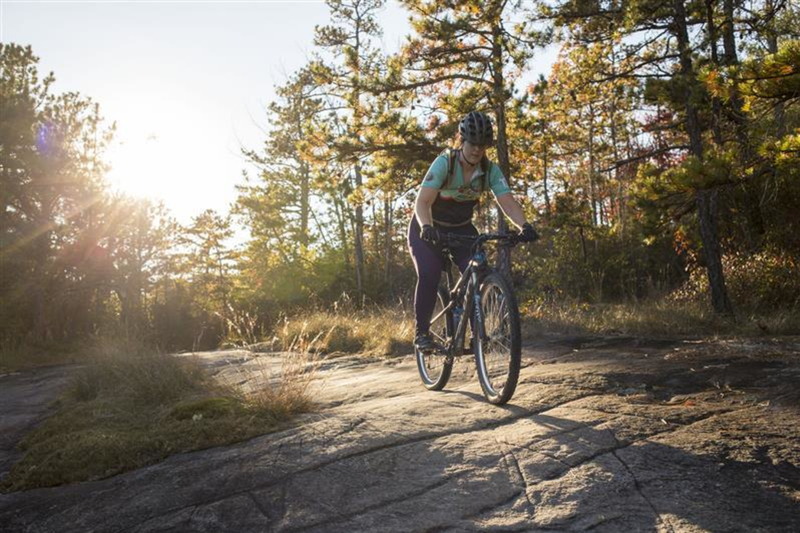 Whatever route you choose, DuPont is going to be a memorable mountain biking experience, and you'll certainly want to return again. And again. Dogs are only allowed on these trails if they’re leashed, so I wouldn’t try mountain biking with your trail dog here. Rangers are definitely watching for this and handing out tickets to offenders. The DuPont trails are also open to horses, and some sections of the State Forest see quite a bit of horse traffic; please be polite, talk to the rider and consider dismounting to avoid spooking any horses you encounter. Check out the DuPont State Forest website for directions and more information.